Annuloplasty Flexible Ring - Model SURGIFLEX (Full Ring & C Ring) - MITRAL and TRICUSPID position. 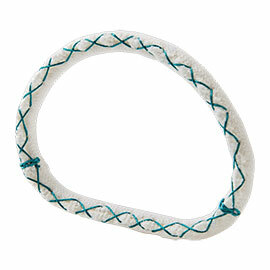 The Surgiflex® flexible rings for annuloplasty are intended for use in patients for the correction of mitral and/or tricuspid human valve insufficiency, or mixed mitral/tricuspid insufficiency and stenosis (acquired or congenital), where treatment does not need a replacement of the natural valve; or to replace an annuloplasty ring that has been previously implanted. The Surgiflex® prosthesis carries out the major function of maintaining the physiologic annular shape and motion. The annuloplasty ring is designed to follow the functional changes which occur during the cardiac cycle, thereby maintaining coaptation and valve integrity in systole while permitting good hemodynamics in diástole. The annuloplasty rings should be used only in cases where visual inspection confirms that the valve is repairable and does not require replacement. The flexibility of the ring enables the recovery of the valve ring while at the same time helps the natural threedimensional movement of the annulus during the cardiac cycle, while providing support against dilatation. The flexibility reduces the stress over the sutures, decreasing the risk of reaping.